How Long Should You Wait Before Sealing Your Concrete Driveway? After getting a new concrete driveway poured, one thing our Houston concrete contractors highly recommends is having your new concrete driveway sealed. Sealing helps to protect and preserve the appearance of your new driveway and guarantees it will last a long time. Most concrete driveways, if properly cared for and maintained, can last as long as 25 years. Concrete is a mixture of water, cement, and either gravel or sand. It has to be mixed carefully using the right amount of each material. Mixing processes help ensure the concrete can be poured and smoothed easily. The mixing process also helps with the curing process, which is where the concrete gradually hardens so it is solid and strong. Unsealed concrete is porous and can absorb various types of liquids such as water and oil. Depending on the type of liquid, it can cause the concrete to become discolored and stained. The fluids will also cause unsealed concrete to gradually start to deteriorate and break down. This can lead to cracking and chipping. Why Wait to Seal Concrete? While it can be tempting to seal the concrete right after it is poured, this is never recommended. There is excess moisture in the concrete that needs to evaporate during the curing process. The total curing process normally takes about a month before the concrete is solid and ready to be sealed. If you were to seal the concrete any sooner, it would create a barrier and prevent the excess moisture from evaporating correctly. As a result, the newly poured concrete driveway would not be as strong as it should be. In addition, the concrete would be more prone to breaking and cracking. Furthermore, the concrete could become uneven as the concrete would not be able to settle correctly. The sealing process is pretty straightforward once your new concrete driveway has fully cured. It is a good idea to verify it is properly cured by having it inspected with a follow-up visit from our Houston concrete contractors. You want to make sure to clean the driveway before sealer is applied. Otherwise, anything left on the driveway will be sealed into the concrete and could lead to staining and discolorations. To clean the driveway, start by sweeping it off with a broom to remove leaves, dirt, and other debris. Next, take a garden hose and nozzle and spray off the driveway to remove any remaining dust and dirt. If there are stains in the concrete that have started to appear, you will want to get these removed. You may use a pressure washer to help remove stains, but you do need to be careful to avoid damaging the concrete by not holding the end of the power washer wand too close to the cement. Once the driveway has been cleaned, you need to let any water on the concrete dry fully before the sealant is applied. Normally, during a bright sunny day, it only takes between two and four hours for the driveway to dry. Choose the right concrete sealer. 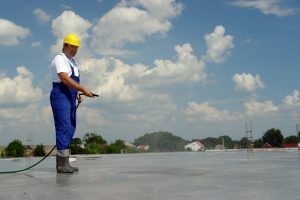 There are several different types of concrete sealers. Some are designed to help protect against staining. Others are designed to enhance the appearance of the concrete and have a glossy finish. There are even sealers that are a mixture of materials to provide multiple benefits, like stain protection and high-gloss finish. If you plan on sealing your driveway yourself, you should avoid sealants from general retailers. These products may not be as superior as the sealants you can get from your local concrete contractor. Apply the sealer to the driveway. There are different application methods you can use to seal the driveway. You could use a brush and “paint” the sealer on. This method can take a very long time to complete, especially if you have a large or long driveway. Another method you could use is to roll the sealant onto the driveway. This method is faster than brushing. Rolling the sealer on also provide a more even finish and better sealant coverage. The easiest and fastest method to use is spraying the sealer onto the driveway. Spray sealing does provide an even finish and allow you to apply the right amount of sealant. Regardless of which method you decide to use, the sealant should be applied until it starts to turn a light white color. This signifies a nice coating of the sealant to ensure the concrete is properly protected. Allow the sealant to fully cure and dry. It is equally important to allow the sealants to fully cure and dry for at least 24 hours before walking on, driving over, or parking vehicles on the driveway. After the sealant has dried, you will want to inspect the entire driveway to verify there were no spots missed. It is easy to see any spots you missed since there will be a color variation from the sealed section and unsealed section. If you find any unsealed areas, apply sealant to these and allow the area to cure and dry for 24 hours. Once your driveway has been sealed, you will need to care for it properly. You should sweep off any dirt, leaves, and debris on a regular basis. You can also use your garden hose and garden nozzle to spray it off. However, you should not power wash the driveway, as this can remove the sealant. If you spill anything other than water on the driveway, it is important to clean up the spill right away to prevent it eating through the sealant and staining your driveway. Depending on the type of sealant used, it will need to be reapplied periodically. Most sealants will last about two years but can vary based on the type of sealant used and the amount of traffic and wear. The steps required to seal your new concrete driveway are not always something everyone can do on their own. Our Houston concrete contractors can include driveway sealing as part of your new driveway installation so you will not have to worry about doing it the first time. If there is staining or any other issues, we will take care of resolving these prior to applying sealant. Not to mention, we already have access to the equipment and sealants required to seal your driveway. The biggest mistake people make when they want to seal their driveways themselves is applying the sealant too soon. They do not wait until the driveway is fully cured. This mistake ends up costing in the long run because their new driveway will not last as long and can develop cracks and other problems, which have to be repaired. Another mistake people make is not cleaning their driveway before applying the sealant. When dirt, dust, and other types of debris are trapped under the sealant, it affects the performance of the concrete. Leaves are especially notorious for staining concrete if they are not cleaned off ahead of time. Another issue that arises is when choosing the right sealant. If you do not select the right one, it may not provide the right protection you require for your new concrete driveway. For instance, if you just apply a glossy sealant, it may not have stain protection. Last, not caring for your driveway after it is sealed can be a common mistake. The sealant does eventually wear off and need to be reapplied. If sealant is not reapplied at the right intervals, the concrete is no longer protected. As you can see, these mistakes can be quite easy to make. This is why our concrete patios and driveways company recommends having us install and seal your new concrete driveway, as well as take care of any repairs and resealing you need. For further information about our concrete driveway and patio services, please feel free to contact Cross Construction Services at 713-244-8509 today! When Is It Time to Replace of Old Concrete Driveways and Patios? Why Design Your Concrete Patio or Driveway Project This Winter?